While partner company arbeit will still be housing artists in Hackney Wick studio spaces, arebyte’s galleries are leaving the area for Canning Town, like so many of the area’s creative tenants at the thin end of gentrification. Their ‘swansong’ comes in the form of these two exhibitions. Opening first, we have media artist Max Colson’s newest animation, The Green and Pleasant Land. Colson likes to invade and satirise real spaces by making them virtual. For example, his Construction Lines takes real plans for a sub-ground apartment complex that was planned for Knightsbridge but never built, and introduces misbehaving avatars for the super-rich, who cavort on-screen. 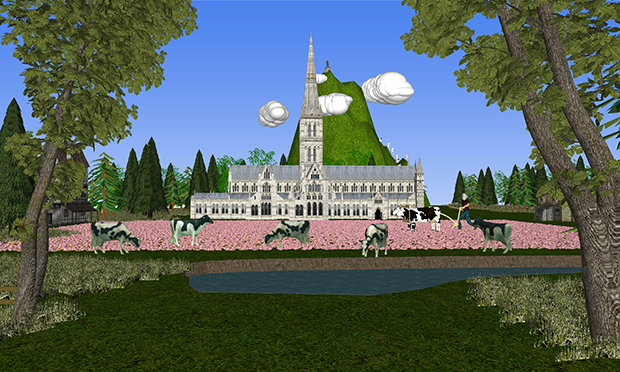 The Green and Pleasant Land takes a similar route – a 3D model of the UK is animated with various scenarios influenced by online comments on articles concerning the English and British countryside. On 8 December at arebyte’s other space on Wallis Road, Dani Ploeger’s fronterlebnis will open. Sussex grad Ploeger traveled to Ukraine, and the frontline of the Donbass War, to create projections, video footage and a VR installation exploring the role and reverberations that modern technology has on good old-fashioned war. Andrew Grassie, facing a painterly crisis after finishing his studies, tried to reboot his practice by forging his own works, one by one, to the exact same scale and spec. This focus on technique fed into this new exhibition at Bethnal Green’s Maureen Paley, Grassie’s third at the gallery. 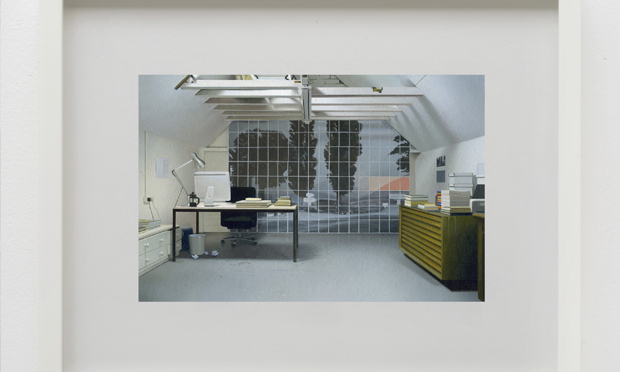 Moving even further into art world metatextuality, while still demonstrating his mastery of the historic egg tempera painting medium, Grassie now recreates art spaces themselves – from ‘behind the scenes’ rooms like gallery offices and empty exhibitions spaces, to fictional installations. As renowned curator Steven Holmes explained in the catalogue for New York group exhibition Sculpting Time, these pieces are both “discursive” on the nature of art and inspiration and demonstrative of “faith in a practice of meditative repetition”. Either way you choose to enjoy these uncanny paintings, they’re well worth a look. Flo Brooks cut his teeth artistically on various kinds of portraiture, from the several album artworks created for drone-rockers Cold Pumas to an ongoing series of pet portraits. His recent work is collected in this latest exhibition, Is now a good time? – an exploration into remoteless, duality, and feelings of ‘liminality’ (the state of being ‘in-between’ in life). These feelings crop up in all humans from time to time of course, but Brooks’ recent life – he is trans and was undergoing Hormone Replacement Treatment during the creation of these pieces, while at the same time tackling a return to his family home in the South West – lend these acrylic on wood snapshots the alternatingly awkward and uplifting power of the personal. His work grabs you with its vividity, charms with its wit and humanity, and leaves you with a peculiarly British mixture of wistfulness and warmth. Judging by recent grotesque tabloid splashes, there’s a fair few people out there who need to see it. 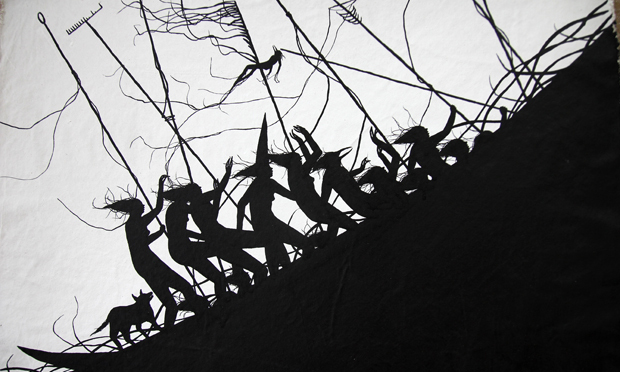 So it makes sense that this debut London show from Spaniard David de la Mano brings street art indoors for a change, to Stoke Newington’s Hang-Up Gallery. Although he’ll be painting the walls of the gallery from floor to ceiling, Adrift also includes inked canvases and paper. The exhibition’s title points to his work’s bleak, poetic treatment of the refugee crisis, and the trepidations of mass movement in general. Despite their monochromatic nature, one of de la Mano’s favoured media is coffee (which you would think works rather better on canvas than on street walls) and he’ll be using the popular morning drink to hand-finish some limited edition screenprints, which will be on sale – 10 per cent of profits will go to Refugee Community Kitchen. Catherine Story is in the business of three-dimensional Cubism. Her creations resemble Picasso or Braque paintings exploded out into theatrical ‘flats’. The theatricality is deliberate, as 1930s film is another key influence on Story’s work, and at night SHADOW turns into a dramatically lit mise-en-scene, viewable through PEER’s distinctive glass frontage. There’s also a strong North African influence, particularly in her choice of heavy-duty, hard wearing materials – she recently visited various outposts and forts in the Sahara desert that were used as film sets for the likes of Laurence of Arabia and Gladiator. SHADOW is accompanied by a short programme of three films chosen by the artist as examples of her influences from early cinema.